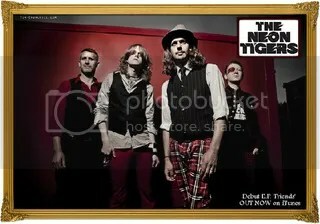 Three quarters of The Neon Tigers join me in the studio tonight. The music played focusses on their EP, a copy of which I was kindly offered before the show. I think a quick word on the packaging is needed! 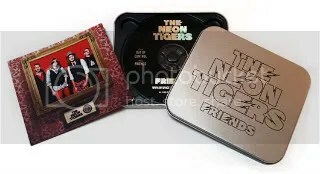 … Friends is presented in a silver tin case. It’s a bit of a ^%$ to get in to, but once you do you’re greeted with a card insert featuring the above track listing on one side and the above band portrait by Tim Churchill on the other. The disc itself is cradled in moulded plastic and the whole package comes across like a collectors edition release. With it being a limited run, I guess it sorta is. You can grab yourselves one of these packages from the band themselves at a gig or at Square Records in Wimborne. In the studio, I must admit I spend much time talking about the band and their stage act, rather than the music. I’m pleased we seem to be of similar mind – they feel that being in a band, they owe it to fans, promoters and venues to put on an impressive show. produce / polish some new material for a second EP. Again, a thoroughly enjoyable time for me, thanks to these excellent guests, once more I’m humbled that they want to take time out to talk to me and my listener about their art and talent. After the show I drop in on Chaplins for the open mic, its been a while since I was here on a Wednesday. There’s a posse enjoying a Christmas meal party in half the room, looks like they’ve reached the end of eating, yet they’re sticking around (mainly) for music and drinks. Andy Stock opens as usual with a long (for him) set of songs. He includes my favourite cover Shoot The Breeze from Alex Roberts. Susanah Lea is also present (having seen her last night in O’Neills); she regularly comes down here from her home up-country. I heard her with a more Country twist last night, tonight she’s doing some more of her own material, and a couple of covers for the benefit of the Christmas partygoers. Graham Jones is last up. This time he’ s a lot more laid back possibly due to the emptier venue (the party crowd left at 11-ish), so there’s only a handful of us left to enjoy this different side to what he normally does.